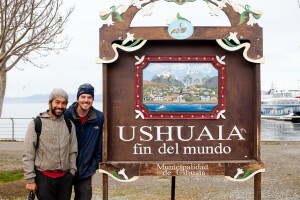 It won’t be a surprise to know that we’ll arrive to Ushuaia at the end of this article. But the ten days to get there from Puerto Natales still worth a few good mentions. If before, on the Argentinian side, the afternoons were still not too cold, here on the Chilean side by the sea, it’s cold and humid all day long. Sleeping without a shelter isn’t an option. The 250 kilometers between Puerto Natales and Punta Arenas were made in three days, sleeping under a barn beside the police station in Morro Chico and inside an abandoned house on the second night. It was a horror movie setting, but anyway, the two of us got over the fear that the owner’s ghost (or the bird’s one, dead on the kitchen table) come to haunt us in our sleep. Once, for a few minutes, snow flakes fall in the glacial wind. In Punta Arenas, I saw an email from travel friends that just arrived in Ushuaia, going through a snow storm as an arrival gift. This bodes well. Punta Arenas is the port controlling the Magellan Straight, a way more North than Cape Horn, where boats goes through to go from the Atlantic to the Pacific and vice versa. The bicycle adventure could have stopped there, pushing to Cabo San Isidro a few 80 kilometers South from Punta Arenas, reaching the southernmost point accessible by road on mainland Americas. But why not going even more South on an island? From Punta Arenas, we take a ferry to Porvenir, on Tierra del Fuego Island. If between Puerto Natales and Punta Arenas we fell like at the end of the world in this unlinked region to the rest of Chile (mandatory passage through Argentina to get there), we felt even more isolated on Tierra del Fuego. Gravel roads aren’t busy, at least in this winter’s in the air. The road winds along the sea side, passing by deserted fishing shacks. Human isn’t predominating, to the profit guanacos, flamingos and dolphins that we can admire in the silence of the surroundings. The wind is favorable towards us, helping us to appreciate even more the place. When roads cross, small structures are erected and gives the opportunity to eat or sleep in those shelter; many cyclists left their marks. A long straight line split the island between Chile and Argentina. We arrive at the custom while sun is setting and the man controlling the cars arriving tells us: “You don’t go further today, go in there and rest”. “There” was officially a waiting room where nobody’s waiting. As a common agreement with everyone at the Argentinian custom, cyclists are more than welcome to spread out their sleeping mattresses in this fully heated room, with a kitchen stove (and a tea pot!) as a bonus. Unexpected comfort. 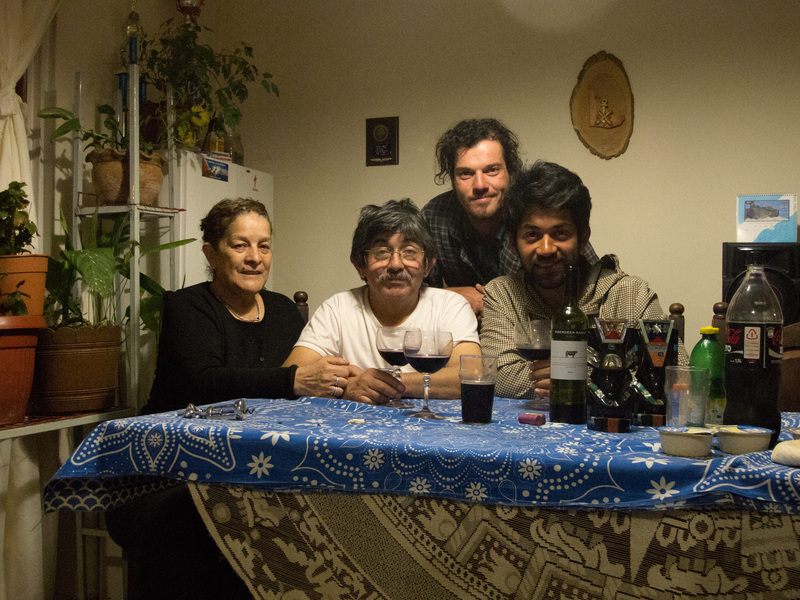 The Argentinian hospitality will sustain us until the end. 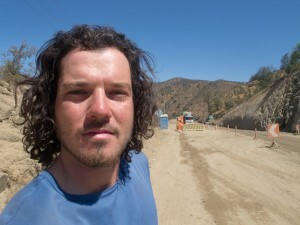 The Argentinian side of the island is more developed than the Chilean’s one and the road is paved. 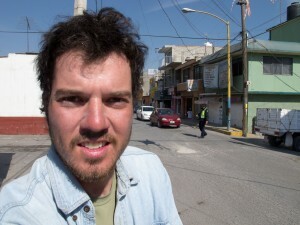 We quickly arrive to Rio Grande, where we are welcomed by Omar, father of an Argentinian now living in Québec, following me since a long while through my website. Quickly we felt part of the family and Omar had fun bringing us to make radio interviews about our adventure… which is four days of being over. Sharing a mix of happiness to finish with the nostalgia of wanting to stay in the rhythm of the road, we leave in the afternoon, camping hidden from the wind and the road behind a barn. 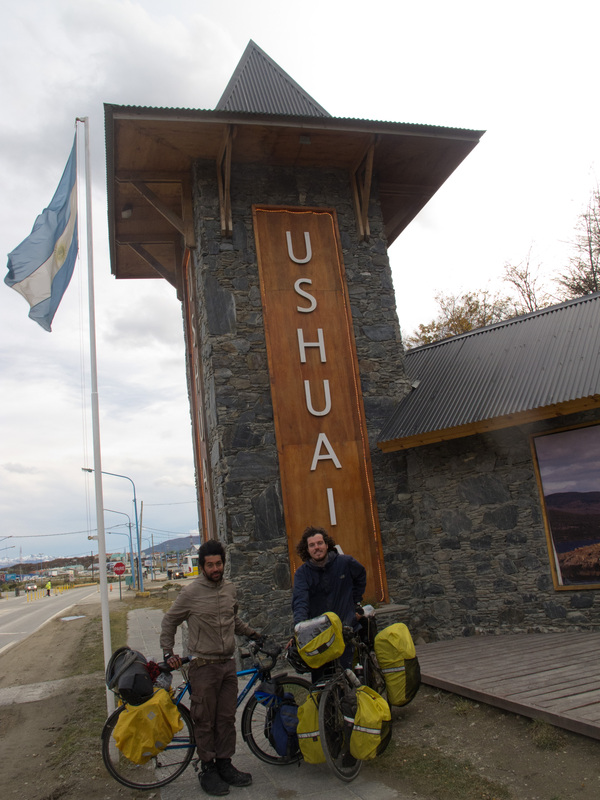 The next day, we go toward Tolhuin, little town halfway between Rio Grande and Ushuaia, a mandatory stop often venerated by cyclists we met. The owner and the colleagues of Panadería La Unión are themselves cyclists and put available a room for cyclotourists, between the storage and the kitchen. What’s better than waking up in the morning with cooking smell, chat with the employees and taste little delicacies? Since we are on Tierra del Fuego Island, the country side was pampa style: not much trees and quite flat. Arriving in Tolhuin though, trees started to impose themselves and here we are in what’s left of the Andes: the Darwin cordillera. So it’s for the last time that we cross over, in a lusty autumn forest, to get down to Ushuaia on the shore of Beagle canal. And here we are, simply like that. The saying tells that “it’s not the destination that makes the travel, but the way to get there”. That way was of 30,700 kilometers, made in 22 months. We have the happiness to meet up with friends who came to visit at our arrival. Radical comfort change! 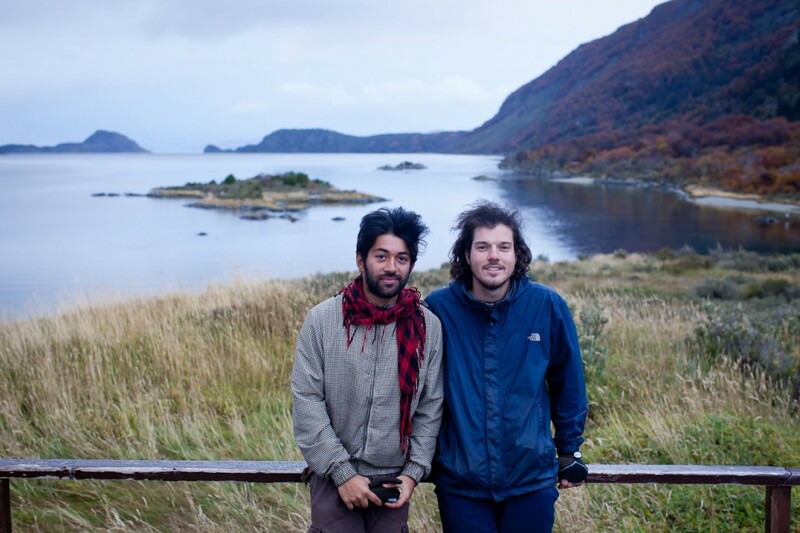 To go to the really real end of the road, we went to Lapataia, two days later, in Tierra del Fuego National Park. I finally met Stéphanie, that I never met before even though it seemed I knew her as I met so many people who met or cycled with her in the last months. She made for a second time the little trip to Lapataia with us. From there, indeed, looking at this bay looking I don’t know where, but where there isn’t a lot of people living, I felt that it smells the end. Other pictures from Dominick here. ** We could have been further South, just to let you know. Navarino Island, on the other side of Beagle Canal, on Chilean territory, has a little town named Puerto Williams and a few kilometers of road. A track more or less clear can bring you to Puerto Toro, which would be the southernmost hamlet in the world with a handful of habitants. 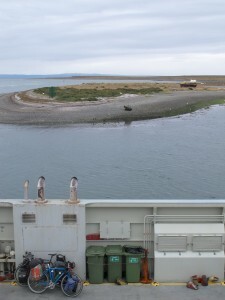 We access the island with a little but expensive sea craft from Ushuaia, or a weekly boat goes there from Punta Arenas. Anyhow, it will be for an other time. I started this trip in Inuvik, from the northernmost point accessible by road in Canada, not on the continent, this one being Prudhoe Bay, in Alaska, a bastion where people lived there just for oil. So I’ll be satisfied with Ushuaia! This entry was posted in 14. Chile, 15. 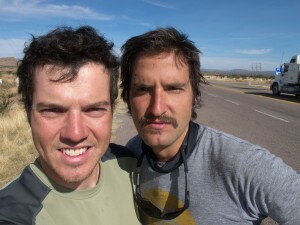 Argentina by CycloExpedition Americas. Bookmark the permalink.